We’d love your help. Let us know what’s wrong with this preview of The Loud Book! by Deborah Underwood. the center of attention (BURP!). To ask other readers questions about The Loud Book!, please sign up. Be the first to ask a question about The Loud Book! Charming! Oh, and pair this with The Quiet Book for a great 2 books gift! This is one time when the “sequel” is just as good as the original, and probably even more fun to read. I loved everything about this book. It’s not a story exactly, though it does go from getting up in the morning to being in bed at night, an extremely busy day, with a bunch of ways to be loud throughout this time, including “deafening silence” and all sorts of happy, funny, scary, etc. ways to be really loud. (The only ca Charming! Oh, and pair this with The Quiet Book for a great 2 books gift! Kids will no doubt think of other ways to be loud and will also have fun reading this aloud with sound effects. The illustrations are perfection. Cuddly and fuzzy, and funny, and the facial expressions are endearing, amusing, and fit each page so well. The pictures are precious, but not in a sappy way at all. I was worried that this one wouldn’t match the first The Quiet Book but it does. They make a great pair of books. They’re appropriate for a wide age range: birth through adulthood, but especially for ages 3-8. Fun for everyone though! The pictures of cuddly bears and bunnies are delightful and the situations are insightful. Of course fireworks are loud, but when is the crackle of a candy wrapper loud? When you are in a darkened theater watching the end of Casablanca,the bear version, that's when! I think young children will enjoy this book although its small size would make it better for an individual child or small group than a large group. 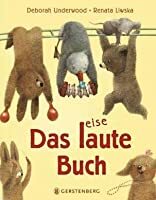 No lexile measure is available, but the repetition of "loud" on each page makes the The pictures of cuddly bears and bunnies are delightful and the situations are insightful. Of course fireworks are loud, but when is the crackle of a candy wrapper loud? When you are in a darkened theater watching the end of Casablanca,the bear version, that's when! I think young children will enjoy this book although its small size would make it better for an individual child or small group than a large group. No lexile measure is available, but the repetition of "loud" on each page makes the text predictable. The charming soft pencil illustrations were colored digitally. Another winner from the Underwood/Liwsak team. This time, our adorable and fun little forest critters are LOUD!!! Everything from good sorts of loud (applause loud!) and not-so-good (dropping your lunch tray loud!) is covered here with the same sweet and humorous style that made The Quiet Book such a winner. I personally preferred the "Quiet" book; I just loved the situations more and guess that, in my busy life, I prefer the quiet to loud ;-p The "Loud" book seems to have a more limited appeal w Another winner from the Underwood/Liwsak team. This time, our adorable and fun little forest critters are LOUD!!! Everything from good sorts of loud (applause loud!) and not-so-good (dropping your lunch tray loud!) is covered here with the same sweet and humorous style that made The Quiet Book such a winner. A companion book to Underwood and Renata Liwska's The Quiet Book. This is thus not original or surprising, though it has some inventive ideas about noise just as the previous book had about quiet. I guess I liked it just a little less but the artwork is also superb in this one. I have this feeling Liwska's sort of fits quiet more than loud, but it's still very good. In the sequel to the immensely popular, The Quiet Book, Deborah Underwood seeks to discover even the smallest of very LOUD sounds. From crowded pools to crickets, no sound is too quiet to not be loud in some way. Featuring the beautiful illustrations of Renata Liwska, this is a book sure to please young and old readers alike. Take a step into the world of very LOUD possibilities and discover that even the smallest sounds become LOUD in the right setting. Sometimes the sounds we hear and experienc In the sequel to the immensely popular, The Quiet Book, Deborah Underwood seeks to discover even the smallest of very LOUD sounds. From crowded pools to crickets, no sound is too quiet to not be loud in some way. Featuring the beautiful illustrations of Renata Liwska, this is a book sure to please young and old readers alike. Take a step into the world of very LOUD possibilities and discover that even the smallest sounds become LOUD in the right setting. Sometimes the sounds we hear and experience have more to do with the non-aural input we're receiving and everything to do with the physical setting of the place we're hearing it in. Is it possible that silence could be LOUD? So much so that it's deafening? Absolutely and especially if you happen to be a child that's just been caught with their hand in the cookie jar. How about a candy wrapper? Probably not if you're at home or at a park, but sitting in a quiet movie during a romantic moment would definitely make a candy wrapper sound ridiculously LOUD! It's these little changes in the way we see things that makes The LOUD Book more than a picture book with beautiful illustrations. It's a book that can help teach a child to reach beyond what they see before their eyes and imagine possibilities! Not only does The LOUD Book! explore the imagination, it's also just plain old fun! What 2 or 4 year old do you know that doesn't like to let loose and run around screaming like a crazy person from time to time? This is definitely the perfect book for exploring and experiences the sounds around us in our daily life. By all means, explore your home, but when you've heard the creaky cabinet take it outdoors to hear the swooping wind behind a blue jay that's dive bombing your neighborhood kitty. It's brilliant and the perfect book to incorporate into a child's daily life, often in very unexpected ways. 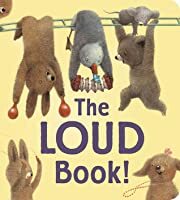 Author Deborah Underwood and illustrator Renata Liwska, whose first picture-book collaboration, The Quiet Book , made for such an excellent bedtime selection, join forces again in this similarly thoughtful examination of loudness. A simple text, one that is little more than a list of loud things - Crowded Pool Loud, or "Deafening Silence Loud" - is paired with gorgeous artwork done in pencil. The result is an engaging book that grapples with the subtlety of something many children enjoy quite a Author Deborah Underwood and illustrator Renata Liwska, whose first picture-book collaboration, The Quiet Book , made for such an excellent bedtime selection, join forces again in this similarly thoughtful examination of loudness. A simple text, one that is little more than a list of loud things - Crowded Pool Loud, or "Deafening Silence Loud" - is paired with gorgeous artwork done in pencil. The result is an engaging book that grapples with the subtlety of something many children enjoy quite a bit - being LOUD! - while also providing an immensely appealing visual narrative. Just as there are all kinds of quiet in The Quiet Book, there are all kinds of loud. 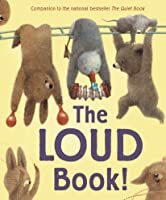 A fun read as it encourages the imagination to think of all these kinds of loud - last slurp loud, walking to school song loud, applause loud, spilling your marbles in the library loud, and many more. Once again, Renata Liwska has enhanced the text with her charming animal illustrations. This book shares all the type of different loud noises one can make. It is an adorable book that will have children wanting to create their own noises. The illustration with the fuzzy bears give a delightful sensation to the text for young readers to follow. I would recommend this book for ages 3-6. I love the pictures (and so do Mommy and Daddy), and I love that the book makes a loud bang when I drop it on the floor. From the time a child gets up to the time he or she goes to sleep, the day is made up of all types of moments. This book tells of some of the most interesting and intriguing types of LOUD! I think the illustrations and text are amazing! But my absolute favorite was... deafening silence loud! My daughter used to want to hide the cookie jar from me too; when I would discover her eating From the time a child gets up to the time he or she goes to sleep, the day is made up of all types of moments. This book tells of some of the most interesting and intriguing types of LOUD! Not as great as the Quiet Book. The small-size, the muted colors, the fuzzy etched line qualities all worked to enhance the quietness of the Quiet book. So when the Loud book used these same techniques, it feels more like a shy person's idea of loud, rather than a REALLY LOUD BOOK. I've seen loud picture books. This one is not that loud. But still, it's a nice sequel. I love trying to figure out the story of these little animals. Especially the brown bunny and his striped iguana who he sneaks to Not as great as the Quiet Book. The small-size, the muted colors, the fuzzy etched line qualities all worked to enhance the quietness of the Quiet book. So when the Loud book used these same techniques, it feels more like a shy person's idea of loud, rather than a REALLY LOUD BOOK. I've seen loud picture books. This one is not that loud. This is the perfect complement to The Quiet Book! Some of these examples of "loud" just really made me chuckle. I loved the variety of examples. Some of my favorites are: "home run loud," "applause loud," "spilling your marbles in the library loud," and "crackling campfire loud." The illustrations are a lot of fun as well and add humor to many of the "loud" phrases. This is a fun book to read along with The Quiet Book by the same author-illustrator team. The different type of loud noises are fun to go through, from very good, to bad noises. The last one, "Crickets loud," is very apt, as our youngest always complains that the crickets are too loud outside her window and she cannot sleep. We enjoyed reading this book together. Deborah Underwood stole my idea! :) When I first read The Quiet Book, I thought to myself, "What a great mentor text to use in the classroom. I'll read my students The Quiet Book and then have them write their own Loud Book." This was such a lovely companion to The Quiet Book. Renata Liwska is probably my favorite children's book illustrator. I mean, is it possible to want to cuddle with a porcupine? In Renata Liwska's world it is! The Quiet Book was one of my favorite picture books of 2010 and The Loud Book is a marvelous book in its own right. I can think of endless classroom applications for this book, but it is also just a fun book to read and share. I like how the author weaves the illustrations into a storyline that connects each phrase. Charming. A padded board book that is the companion to The Quiet Book. This is a fun preschool concept book that is not only a good read aloud and discussion, but is a good writing prompt resource for older readers. Like The Quiet Book, this story is a concept arranged around all kinds of loudness events that are easy to relate to (i.e., "home run loud"), and as such it really works. The drawings are amusing enough, but I just wish these books weren't so cute, with smiling and startled animals. Just as good as its prequel, the loud book captures the "so true" loud moments in a child's life. A lot of these louds are awfully quiet. A companion book to The Quiet Book, this one is all about loud things encountered. Lovely illustrations. Very cute book for beginning readers! This book goes over both good loudsna and bad louds. Both the words and the sentences are short. The last word on every page is "loud" so the reader knows what to expect and can follow along. Sequels always make me a bit nervous and this book is a good demonstration of why: it uses the brilliance of the first book as a formula and in so doing, it loses much of the magic and originality. As fellow GoodReader Beth Kakuma-Depewt said, "The small-size, the muted colors, the fuzzy etched line qualities all worked to enhance the quietness of The Quiet Book. So when The Loud Book used these same techniques, it feels more like a shy person's idea of loud, rather than a REALLY LOUD BOOK." Sti Sequels always make me a bit nervous and this book is a good demonstration of why: it uses the brilliance of the first book as a formula and in so doing, it loses much of the magic and originality. As fellow GoodReader Beth Kakuma-Depewt said, "The small-size, the muted colors, the fuzzy etched line qualities all worked to enhance the quietness of The Quiet Book. So when The Loud Book used these same techniques, it feels more like a shy person's idea of loud, rather than a REALLY LOUD BOOK." The reader follows along to experience all of the different kinds of "loud" there is. From the time the bunny wakes up in the morning to the time it goes to bed, there are so many loud things throughout the day. Whether it's a burp during quiet time or a belly flop in the pool, "loud" can be heard all over. I really enjoyed this book. It gives the reader great examples of good and bad types of loud. However, what makes the book so good is that the author does it in such a fun way. I also liked the illustrations because they really allow the reader to imagine each scenario. Overall, I would recommend this book to young readers to teach what loud can look/sound like. How many kinds of loud are there? More that you can think of, but here are a few to get you started--surprise loud, applause loud, fireworks loud, and crickets loud. What I thought: I didn't think Underwood and Liwska could top The Quiet Book, but I was wrong. The Loud Book! is great. Children love making noise and that means they'll love this book, too. The text is simple and the illustrations are beautiful. My favorite kinds of loud from the book are home run loud, thunderstorm loud, and firew How many kinds of loud are there? More that you can think of, but here are a few to get you started--surprise loud, applause loud, fireworks loud, and crickets loud. What I thought: I didn't think Underwood and Liwska could top The Quiet Book, but I was wrong. The Loud Book! is great. Children love making noise and that means they'll love this book, too. The text is simple and the illustrations are beautiful. My favorite kinds of loud from the book are home run loud, thunderstorm loud, and fireworks loud. My favorite kinds of loud that the book didn't mention are story time loud (Yes, story time can be VERY loud!) and visiting home loud. My favorite illustrations are applause loud, Aunt Tillie's Banjo Band loud, and fireworks loud. Trivia About The Loud Book!